creating less pressure change as the tire heats up. The Goldspeed Victory Lock ATV rear beadlock wheels are a 5x back to back AMA Championship winning wheel used by Chad Wienen factory Yamaha ATV racer. The Victory Lock rear beadlock wheel is constructed of a light weight heat treated 6061 Aluminum & designed to be stronger than its competitors in the market today. 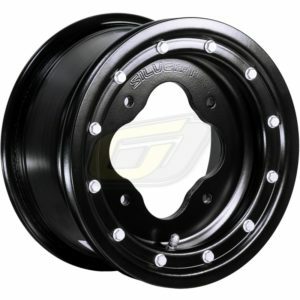 The Goldspeed Victory Lock ATV wheel features a universal bolt pattern that fits all major sport ATV brand & models to make it easier & more affordable to stock. The Goldspeed carbon fiber beadlock rings have proven to hold a 75% better chance of your tire sidewall not getting sliced compared to the old style aluminum beadlock rings most others offer. Yes you read that correct this wheel has won the last 5 AMA Pro Atv championships and has a track record of wining hundreds of races around the world. Goldspeed did not invent the wheel we only made it better ! Goldspeed is a strong supporter of the ATV Industry world wide and proud to be part of it. Thank you to all that believe and trust the brand.